Remarts:This bottle is olive green; the globular body has a flattened and indented base. The tall neck has a slight constriction where it joins the body and is decorated with a ruffled collar. The form may be from the crossover time between Roman and Islamic periods. 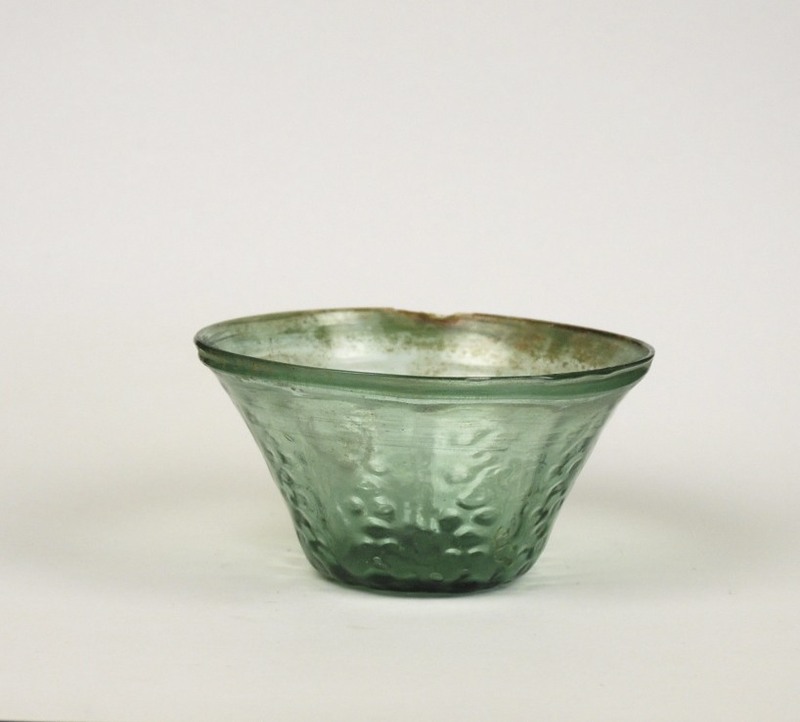 This pattern-molded bowl is made of clear green glass with an out-splayed rim. Bowls of this type and color can be found in many different sizes and patterns. It is possible that such glass vessels were used as lamps. This green glass flask is unusual due to the elaborate chain decoration, a late Roman motif, which was transitional into the early Islamic styling. The bottle was made by blowing molten glass into the vessel shape, applying trails which were then pinched to forming the chain decoration. The neck of the vessel is rather elongated giving way to a wide funnel mouth topped by a thick rounded rim. Dishes of this type were often used in sets during the Roman Imperial Period. 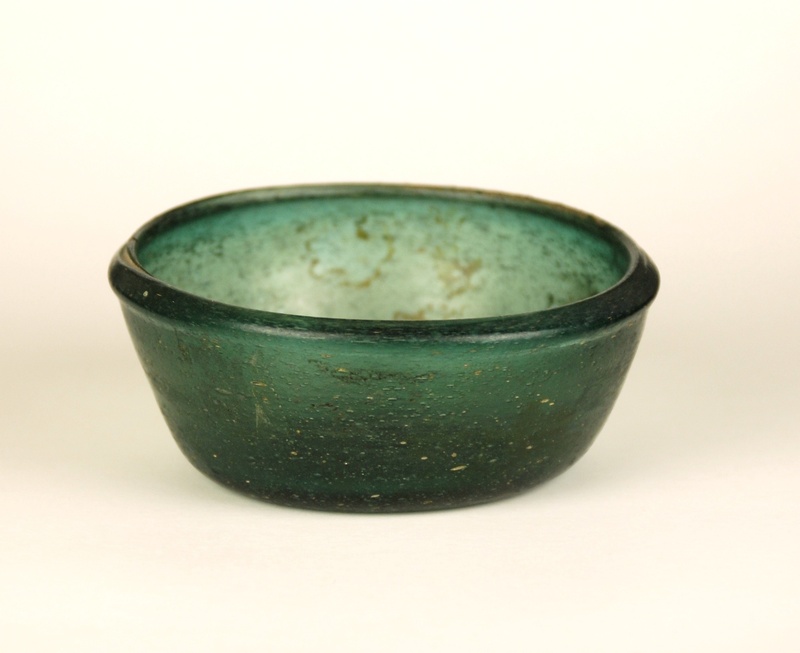 This particular dish of blue/green color has a brilliant iridescence covering the interior base. It has a profiled thick rim with a high concave base. The dish has been mended. It is possible that this bowl is not Roman but from the early Islamic period 7th or 8th century. H: 4.5 cm. Rim D: 12.5 cm. This is a palm size dish or bowl may have had a lid. It is made of thickly blown dark green glass with many trapped air bubbles. It is late Roman or Islamic. This pattern-molded bowl is made of clear green glass with an inward folded rim. Bowls of this type and color can be found in many different sizes and patterns. It is possible that such glass vessels were used as lamps.